Before the Senate Committee on Energy and Natural Resources, Thursday, September 27, 2007 at 9:30 a.m.
Download this letter and its attachments as a PDF. Download a PDF of EWG's comments below, or view the press release. Washington, July 27 — House Agriculture Chairman Collin Peterson, Ranking Member Bob Goodlatte, members of their committee, and their staffs, are to be commended for working long and hard to produce the Farm Bill passed by the House of Representatives today. We are writing to urge the Committee to support S. 742, The Ban Asbestos in America Act of 2007, and to commend those Committee members who have already cosponsored this important legislation. "Flame retardants present a growing risk to human health, particularly the health of infants and children, and levels in the environment appear to be increasing. Today's vote represents a great victory for Washington activists, and could boost similar efforts in states across the country and set the stage for a national ban." EWG is disturbed to learn that Dennis C. Paustenbach is on the "Short List" of potential appointees to the Asbestos Panel of the EPA Science Advisory Board. EPA's Ispecifies that appointees to the Panel should display "absence of financial conflicts of interest" and "absence of an appearance of a lack of impartiality." 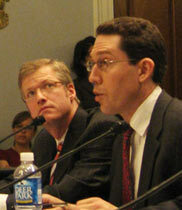 Based on evidence of his work for defendant corporations in lawsuits over asbestos exposure, his studies that consistently aim to refute or minimize the scientifically established risks of asbestos exposure, and other evidence detailed below of a lack of adherence to scientific and professional ethics, it is clear that Dr. Paustenbach is unfit to serve on the Panel.